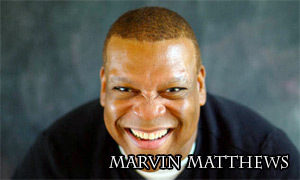 “Marvin Matthews is the music industry’s best kept secret,” stated a music industry insider. That’s high praise for someone who once thought he wasn’t cut out for a career in music and initially planned to be an attorney. But Marvin is hardly ordinary. A tireless concert artist and a natural-born entertainer, Matthews is comfortable on a concert stage performing with a symphony, singing with soundtracks for a small gathering or delivering his distinctive blend of music and inspiration during a keynote presentation. His exuberant personality combined with his unique vocal talent and compassionate spirit cross all barriers. 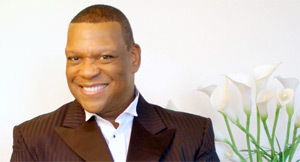 He has worked with many popular artists including Debbie Boone, AndrÃ©a Crouch, the late Bob Hope, Whitney Houston, Mark Lowry, Little Richard, Johnny Mathis, Karen Wheaton, Deniece Williams and CeCe Winans. He toured Romania at 18 and was a soloist with the world-famous Spurrlows. He’s sang in European opera houses and has been a featured performer at three summer Olympicsâ€”Barcelona, Spain; Atlanta, GA; and Sydney, Australia. He also electrified the Philippines on “Martin After Dark,” the number one rated television show in that country. Matthews has eight recordings to his credit and two video presentations. Marvin is committed to inciting love in the Body of Christ. He sings because he’s happy. He sings because he’s free to be all God has called him to be. To book Marvin Matthews, please contact Lisa Darden at lisa@huptalentandbooking.com or call 240-446-1554.